Keep it Clean - CLEANSING MITT FOR A FAST & DEEP CLEAN by Beutyblender. The whole is placed in aesthetic packaging. 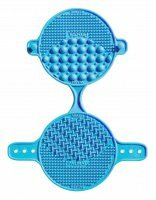 - CLEANSING MITT - The mat has slots in which you can slide your hand so the product can serve as glove.Apply soap, rub the sponge onto the mat in order to perfectly remove any dirt and stains. The glove can be also used for cleaning makeup brushes. 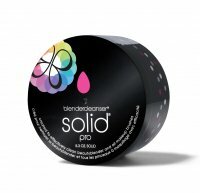 - BLENDERCLEANSER SOLID SOAP. 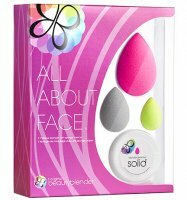 It is designed to clean beautyblender sponge to keep it in perfect and hygienic condition. The product contains soy extract which is good for your skin and sponge fibers. The formula has antibacterial properties. No artificial colors - it is ecological. It has pleasant, lavender scent. 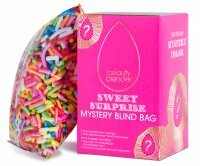 Beautyblender and brushes cleaning kit. 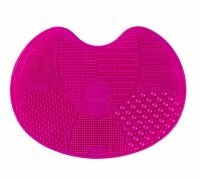 Keeps your cosmetic accessories clean and hygienic.